The grade 3 class ,together with the principal ,Ms Tonya Phillip of Claudia Creque Educational Center would like to take this opportunity to honour Kimoyah Smith and Alexander Wheatley as being the star students. According to Ms Candia Mc Farlane, the grade 3 teacher, the Class Dojo is a behvavioural management tool being used for her students in which they are rewarded with points at the end of the day for positive and or negative behaviours. To be a star student, the student must consistently be ‘student of the week’ for at least 3 consecutive weeks, with high scores. As a result, students are rewarded in different ways. Today they are being written about in the local news, which is one form of reward . 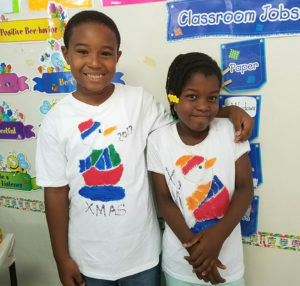 Kimoyah Smith and Alexander Wheatley have been quite active in ensuring they secure the highest points each week, and they have both maintained the student of the week status for the past month and a half. That is following classroom rules, participating in all class activities, being prepared, active listening and just to name a few. Congratulations to our class Dojo Champions and also their parents. As we also would like to acknowledge the other students who keep striving. Kimoyah Smith is the daughter of kerbin Smith and Shenelle Vanterpool . During an interview with Kimoyah she said ” I enjoy reading.” While mathematics and science are her favourite subjects. 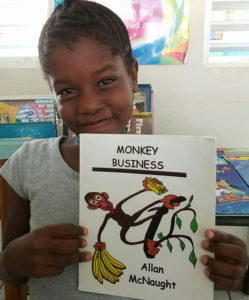 Kimoyah is a strong believer that education is the key and would like to encourage other children to believe the same. She also believes, that it is important to obey your teachers and parents at all times. Kimoyah was overwhelmed when she learnt that her reward would be an article about her published in a local news . Her response was I feel like a queen.